280 p., 14,7 x 20,8 cm. 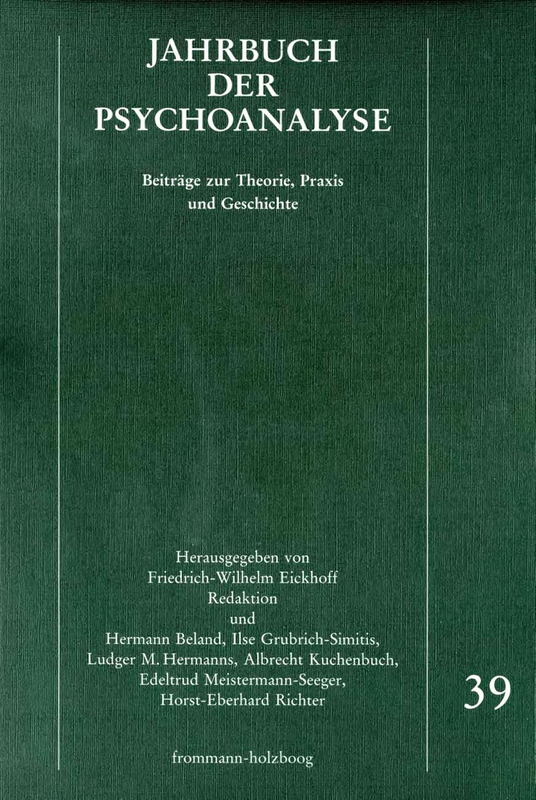 With contributions by Peter Dettmering, Ernst Federn, Sigmund Freud, Marie-Luise Knott, Mechthilde Kütemeyer, Jean Laplanche, Sebastian Leikert, Heiyöng Moser-Ha, Paul Ries, Jochen Stork and Katherine Stroczan. Psychoanalysis began »neurologically«, with the systematic clinical description of psychogenic (hysterical) disorders. Stimulated by Charcot - after his return from Paris, simultaneously discovering his psychoanalysis-, Freud write several articles about the clinical signs of hysterical conversion which have scarcely been noticed until now in spite of their enormous significance for general medicine. For instance, the contribution about »Hysterie« in Villaret’s Handwörterbuch der gesamten Medizin (1888b) was not identified by Paul Vogel until 1953 as a writing of Freud and re-published in Psyche. The study about the difference of hysterical and organic palsy (1893c), included in Gesammelte Schriften (1924-34) and Gesammelte Werke (1940-52) in its original French version, has never been considered worth translating into German and therefore is almost unknown. Consequently, there is no practical application of the useful diagnostic signs of psychogenic palsy/attacks/pain etc. elaborated by Freud - one of the reasons why psychogenic disorders are recognized too late and become chronic as a result of aggressive medical therapies. Instead, there is a prejudice that conversion symptoms have disappeared more and more since Freud. Hysterical conversions are recognizable, according to Freud, by special clinical signs: they show excessive manifestation (e.g. ^»algesia), nonanatomic localization (hysterical palsies are proximally accented, in contrary to the distally accented cerebral pareses), they increase after invasive interventions. The knowledge about these - and other - «neurological» signs could yield to the physician positive indications of a present hysterical disorder and contribute to early clinical diagnosis, without and before knowing exactly the unconscious conflict. I will give an impression of the content, the history of reception and repression of the French article from 1893, just translated in German (together with the contribution in Villaret’s Handwörterbuch 1888) and demonstrate its relevance for general medicine, neurology and psychoanalysis. Paul Ries: Geheimnisse einer Seele: Wessen Film und wessen Psychoanalyse? On 5 June 1925 the Berlin film producer Hanns Neumann visited Karl Abraham and informed him of a plan to make a popular-scientific film and an easily intelligible popular programme on psychoanalysis. Abraham answered that he didn’t feel he was the right person for such a project but as he feared that «wild analysts» might accept the offer to be scientific advisers and as Neumann had assured him control of the psychoanalytic side of the project, he decided, supported by Hanns Sachs, to cooperate, although Freud was not prepared to authorise the project and other colleagues tried to destroy it. Under these conditions Abraham and Sachs became connected with a world of the cinema in which the original project to make a plan training film was transformed with the help of the famous director G. W. Pabst, leading top stars, outstanding cameramen and inventive scenery designers into a full-length feature film, which was recognized immediately after the premiere in Berlin on 24 March 1926 as a national and international milestone in the annals of film history but which is still regarded owing to his content as a millstone round the neck of psychoanalysis. This paper deals with the work of psychoanalysts on the subjects of history. It begins with Karl Abraham’s paper on Echnaton and his Oedipuscomplex, then follows Ernest Jones about the unconscious conflicts over homosexuality in the brother of Napoleon Louis Bonaparte and Ludwig Jekels long historical Paper on the Oedipuscomplex of Napoleon I. Right after the First World War Paul Federn published «The Fatherless Society» as an effort to understand the revolution as the killing of the father. During the Second World War Oscar Pfister wrote a book about Anxiety in the history of Christianity, Peter Loewenberg tried later to understand Heinrich Himmler psychoanalitically and Arnold A. Rogow did the same with the leader of the Austrian Socialdemocratic party, Otto Bauer, the brother of «Dora». Erik Erikson and Peter Gay are mentioned as psychoanalitically oriented historians. In another direction went Bruce Mazlish and Lloyd DeMause with a few others explaining all historical development through the relationship between the generations. This was called «Psychohistory» and began in the early 1960 in the USA. The significance of this historical research is appraised as it is used as a tool for understanding our past and present civilisation and culture. Psychoanalysis must not be considered as a set of technical recipes, which could be subordinated to external goals (such as: health, adaptation, training etc.). The goals of psychoanalysis are intrinsically bound to its very process. This one, in its turn, should be examined in the light of the constitution of the «soul apparatus» (seelischer Apparat) of which the cure intends to be a reinstoration and a new elaboration. The major dimension of both - the originary and the analytic - situations, is in relation to the (sexual) enigma of the other (the adult for the infant, the analyst for the analysand). Only this relationship («hollowed-out» transference) provides for the necessary force in order to set to work again the originary process. After the end of analysis, the relation to the enigma is subject to two possible destinies: either to be closed up again, or to remain open, as inspiration, that is as a potential opening by the other (better said than: to the other). This last possibility can be termed as «transference of transference». I have presented the case of a woman who functions mainly in borderline between the PSP and the DP. The meaning of the central feature of the claustro-agoraphobic dilemma and the solution that she has to take in the borderline area is understood in terms of her defensive retreat into the BP. I have also attempted to show that inspite of the severity of her pathology analytic work has been done through my function of «reverie» and «holding». Her use of projective identification and my working with the countertransference is presented in a detailed session. We report on a catamnestic study in which we interviewed patients who had been treated in a psychoanalytically oriented inpatient setting about their development in the 10 years after psychotherapy. The psychoanalytical investigation of these interviews made evident, that the former patients did not make use of the new conflict-solution they had acquired during their psychotherapy but only after a period of latency. The concept posttherapeutical crisis describes the point in time, when patients reorganise their everyday-life according to the new conflict-solution, which had previously been desintegrated. The characteristics of the posttherapeutical crisis can be considered as criteria for the success of a conflict-centered psychotherapy. The article attempts to demonstrate that this century now approaching its end has produced in modern art und psychoanalysis two powerful movements which have fundamentally changed life and the world and created a now intellectual way of grasping human beings. It begins with a historical excursion into the time at the end of the last and the beginning of this century, the time of the discovery of modern art and psychoanalysis in which visions of doom had achieved a great significance and deceptive search for harmony was starting to spread. Together with modern art it was psychoanalysis which touched upon the «sleep of the world», as Freud put it with Hebbels’ quotation, and which liberated the Unconscious and with it the irrational in human beings and irrationality from incomprehensiveness. With it an opening to a new inwardness became possible which is understood as a basic and incessant questioning of all that appears natural and familiar. The most conspicuous feature of Balthus’s oeuvre is its insulation against all artistic currents of this century. This peculiar ›immunity‹, unbrokenly sustained by the painter for over half a century corresponds in his work with the hermetic isolation of his interiors. It is precisely this double and persistently maintained boundary and separateness which calls for a closer look at the structure of this fantasmatic world of images and incites an investigation of its intent. Focussing on three recurring elements - the window, the cat and the mirror - the prevalent themes are considered and their formal and affective connotations are discussed. The analysis of the latent content concealed behind displacements, negations and anticathexes unravels the unconscious strategy of the pictures which then can be examined and elucidated. Thus it becomes evident that attributes continually implored by Balthus’s critics, namely the apparent ›poetic beauty‹ and ›divine appeal‹ of these paintings, can only be understood as manifest qualities blatantly contradicting their essential intent. «The Strange Case of Dr.Jekyll and Mr. Hyde» (1885) by R. L. Stevenson is seen as a clinical case history which is shaped after the contemporary notions of personality split («dedoublement"). Seen from a self-psychological perspective (Kohut, Kernberg), there is a polarisation of ego-ideal (incorporated by Jekyll) and grandiose self (Hyde). The aggressive character of the latter is evident. Stevenson puts the reader into the role of a therapist or detective, who has to solve the case in his own wit.